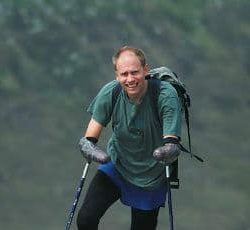 Quadruple amputee mountaineer and motivational speaker. Jamie Andrew’s story is a truly remarkable tale of resilience, positivity, and facing challenges head on. Having lost his hands and feet to frostbite after being stuck for five days near the summit of an Alpine mountain, Jamie has coped incredibly well and has turned his experience to something positive that has moved and inspired audiences across the board. Mountaineer Jamie Andrew OBE is a truly exceptional person who nevertheless unassumingly describes himself as an ordinary guy who just happens to have gone through extraordinary events. In January 1999 Jamie survived for five days at the summit of an Alpine mountain while a storm raged and temperatures dropped to minus 30 degrees Celsius. Suffering from hypothermia and severe frostbite, he was nevertheless still conscious when he was rescued by the French Mountain Rescue Service who arrived tragically only hours too late to save his climbing partner. Ten days after his rescue, Jamie’s hands and feet, damaged beyond repair by the frostbite, were amputated. Three months after his quadruple amputation, Jamie emerged from hospital, walking on prosthetic legs and having relearned to manage everyday tasks like feeding, washing, and dressing himself. 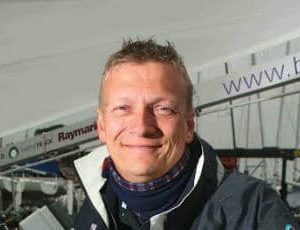 Jamie defied all expectations by then learning to ski, snowboard, sail, and paraglide, as well as running the London marathon and returning to climb once again the mountains that he loves so much. He has since run more marathons, completed Ironman triathlons, and climbed challenging mountains worldwide, raising tens of thousands of pounds for charity. In 2012, Jamie was awarded an OBE for services to charity. With his humble and unassuming manner, as well as an unshakably positive attitude towards life and its challenges, Jamie is an extraordinary example of bravery and determination. He is an inspiring and gifted speaker who delivers lectures, keynote addresses, and after-dinner talks with unpretentious modesty, passion, sincerity, and humour, and he never fails to move and inspire his audience. Jamie’s presentations are hugely valuable for businesses. Drawing on his experience as a mountaineer, the challenges he faced when he lost his hands and feet, and the strength he found within himself in rebuilding his life, he covers numerous concepts that are directly applicable to the business world. I can only say that Jamie is a great person. He's a man with an incredible character but with a great heart too.